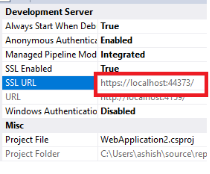 SSL stands for Secure Sockets Layer and is used for enabling encryption in the browser/server communication.You can enable SSL in IIS Express in Visual Studio by just setting some properties without any code changes. 1.Select the Web Project in the solution explorer. 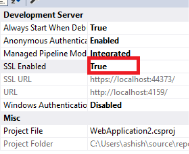 2.Press F4 to display the project properties.Locate the property SSL enabled.Set the value of this property to True. 4.Open the project properties by right clicking on the project and selecting project properties.Go to the Project URL field. 5.Select the checkbox Override application root url and in the corresponding field enter the SSL URL you copied in step 3. Now you can navigate to https://localhost:44373/ to access your website using https protocol.